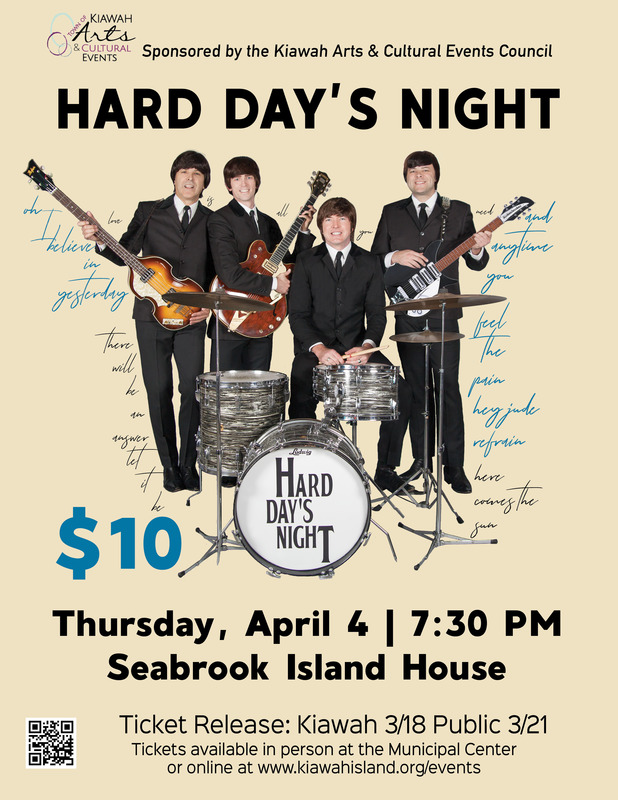 Tickets available here beginning 3/21 at 9 a.m.
Beatlemania takes over Kiawah on April 4th with a performance from the top-rated national Beatles tribute group, Hard Day’s Night. For 14 years, Hard Day’s Night has been entertaining Beatles fans across the country. The group is one of the few touring Beatles tribute bands that, through its musical talent and dedication to authenticity, was invited to perform at the world-famous Cavern Club – the birthplace of the Beatles – in Liverpool, England for International Beatles Week. Hard Day’s Night is dedicated to the Beatles’ touring performance standard of playing without recordings or click tracks. The band performs songs from the 1962-1966 era exactly as the Beatles themselves did: four musicians onstage, in character as John, Paul, George, and Ringo, wearing perfect stitch-for-stitch replications of the suits made famous by the Beatles, with authentic Vox, Hofner, Gretsch, Rickenbacker, and Ludwig instruments, playing the world-famous songs note-for-note.